Last update issued on March 7, 2003 at 03:25 UTC. The geomagnetic field was unsettled to minor storm on March 6. 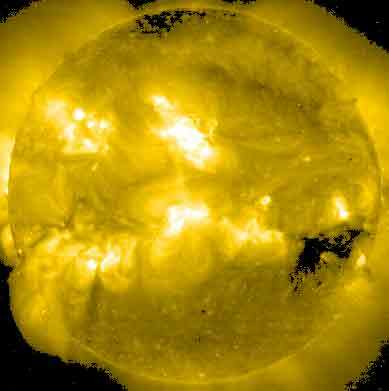 Solar wind speed ranged between 462 and 569 km/sec under the influence of a high speed stream from coronal hole CH24. An additional disturbance may have arrived at 09:45 UTC at ACE. Solar flux measured at 20h UTC on 2.8 GHz was 150.3. The planetary A index was 25 (STAR Ap - based on the mean of three hour interval ap indices: 26.4). Three hour interval K indices: 44445333 (planetary), 43433333 (Boulder). At midnight there were 6 spotted regions on the visible disk. Solar flare activity was very low. Region 10295 decayed slowly and quietly. Region 10296 decayed slowly in all sections. A couple of small negative polarity spots emerged ahead of the huge positive polarity penumbra. Region 10297 decayed and lost most of the spots it had gained the previous day. Region 10300 decayed and became spotless, then reemerged with a single spot. Region 10301 lost several small spots and was otherwise mostly unchanged.. Region 10302 was quiet and stable. 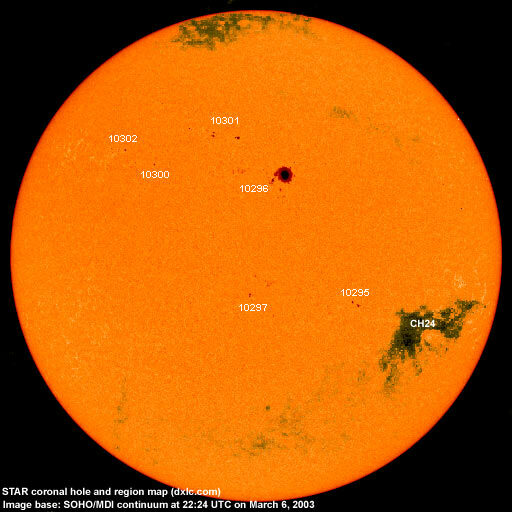 March 4-6: No obviously geoeffective CMEs observed. A coronal hole (CH24) in the southern hemisphere was in a geoeffective position on March 2-3. Processed SOHO EIT 284 image at 19:06 UTC on March 6. 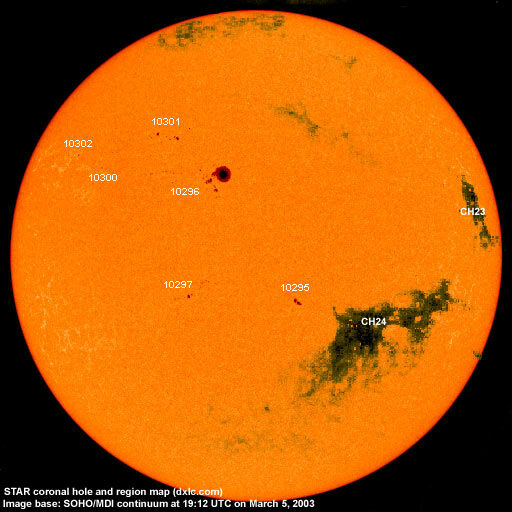 Any black areas on the solar disk are likely coronal holes.